WASHINGTON, D.C. — With U.S. unemployment at its lowest level in nearly 50 years, the importance of advanced degrees to obtaining good jobs may be growing. Will this leave some groups of young people even further behind in the career gaps? A new study of undergraduate college students attending colleges most likely to send students on for advanced degrees, conducted by Gallup for the Association of American Law Schools (AALS) and the Law School Admission Council (LSAC) found that while many black and Hispanic and first-generation college students aspire to advanced degrees, their interests in, reasons for and potential barriers to pursuing advanced degrees often differ from those of their counterparts. How likely are you to go to graduate or professional school to obtain a graduate or professional degree (e.g., MBA, other master’s, law, medical, dental or other PhD) at any point? Results for this study are based on 22,189 survey responses from a nationwide study of undergraduates at four-year degree-granting institutions likely to have students who go on for an advanced degree. These results are part of a larger study — Beyond the Bachelor’s: Undergraduate Perspectives on Graduate and Professional Degrees —conducted by Gallup for the AALS and the LSAC to understand the factors both driving and discouraging undergraduates when they are considering a graduate or professional degree. The types of advanced degrees college undergraduates are interested in pursuing could help universities better understand how to foster attendance at postsecondary institutions. Master’s degrees are the most sought after, with nearly two-thirds (63%) of those interested in advanced degrees considering MA/MS degrees, and about one-quarter (23%) considering an MBA. While one in three (34%) say they are considering a PhD, significantly fewer are considering professional doctorates of JD (15%) or MD (14%). Among students likely to pursue any advanced degree, Hispanic students (18%) are less likely than students overall (23%) to report considering an MBA, while more Asian students are considering an MBA (28%). The cost of an advanced degree (68%) is the top reason that might prevent undergraduate students likely to pursue an advanced degree from pursuing one; however, cost is an especially significant barrier for black and Hispanic and first-generation college students. Three-quarters of black (77%) and Hispanic (75%) students, versus 58% of Asian and 68% of white students, cite high cost as one of the top factors discouraging them from attending graduate or professional school. Similarly, 76% of first-generation college students compared with 70% of students with at least one parent with a bachelor’s and 62% of those with a parent who has an advanced degree cite cost. Black and Hispanic college students are less likely than their white counterparts to say they see or receive information on PhD, MD and JD degrees, as well as other master’s and other professional degrees. Which, if any, of the following types of graduate or professional degree programs have you seen information on, either around campus such as job fairs/graduate school fairs, general notices, or in a counselor’s office or through direct mail or email? 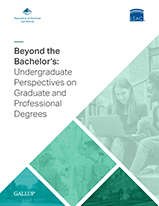 Read the rest of the Beyond the Bachelor’s: Undergraduate Perspectives on Graduate and Professional Degrees report.